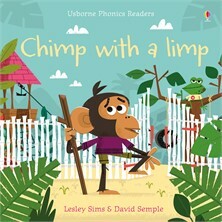 Cheeky Chimp has a limp…or does he? Follow his extremely tall tale as he explains why he cannot possibly help Cheetah. This fun story, specially written to develop phonemic awareness, features simple text and wonderful illustrations by David Semple. It’s ideal for reading aloud and for children who are beginning to read for themselves.